This month I would like to bring some light to our First Responders who not only serve every day and risk their lives in their communities but, off the clock they continue to give back. I have included some touching stories that I enjoyed reading, I hope you do too! The purpose of the event is to foster positive relationships between youth and officers. Young kids, K - 6th grade are selected each year during the end-of-the-year holiday season to shop at one of the local area stores to purchase gifts for members of their immediate family. Each child is given a small amount of money to spend, normally $50-$100 depending on the size of the child's immediate family. Approximately 1-2 children are assigned to each police personnel, who then escorts them around the store and assists in selecting appropriate gifts for each family member. The children are told, and understand, that the money is not for personal use and must only be spent on members. After shopping, the children will eat lunch, wrap their gifts, and continue to get to know the police officers. It has long been noted that relationships between the police department and the Frogtown and Summit-University communities, particularly the communities of color in these two communities, have been very strained. The initial intent of the program was to address the issue of repairing and making these strained relationships better. From a functional standpoint, it was felt that to address this issue the place to start was with the younger kids, ages 5 and up. The effects of the program are multi-faceted. Shop with Cops hopes to break down the barriers between the community and the police with the intent of developing a better and more trusting relationship. The program started in the winter of 2000. The initial idea started with Retired Chief John Harrington, then a Senior Commander with the St Paul Police Department Western District and Arnoldo Curiel, then Coordinator of the Frogtown Weed and Seed initiative. As the program progressed it was joined by the Amherst H. Wilder Foundation, District 7 and 8 Planning Councils, West Minnehaha Recreation Center, and various members of the Frogtown and Summit-University communities. From 2000 -2004 the operating support for Shop with Cops came from federal Weed and Seed dollars, a strategy which “weeds" out crime in communities and plant the "seeds" for positive change and development. Since its original conception, those involved in the planning and implementation have changed somewhat. For example, the Frogtown and Summit-University communities no longer qualify for Weed and Seed funding and therefore no longer cover operating expenses. However various members of the Frogtown and Summit-University communities continue to volunteer to operate the Shop with Cops. In addition, while the involvement of the St. Paul Police Department has not changed, personnel changes have occurred. Retired Chief John Harrington is no longer involved with the program from an operation standpoint. But Chief Smith, the city's current Police Chief, is in support of this program and its objective in creating positive ties between children and police. Senior Commander Paul Iovino (current Western District Commander) has assumed those duties supplied by the police. In 2000, its first year in operation over 50 kids and 15 officers were involved. During the 2009 event, Shop with Cops had 213 kids participating and over 107 officers from St Paul Police Department volunteer their time. The Christmas season got a little brighter on Wednesday for some Merced kids who’ve had some tough times recently. Merced police pitched in to help 18 kids who are underprivileged or from families that have fallen on hard times. Kids such as 6-year-old Jocelyn Chavez. A little more than one and a half years ago, Jocelyn’s good friend and neighbor, 5-year-old Geraldine Perez, died in a duplex fire on East 10th Street. Geraldine’s father, Ignacio Figueroa-Bautista, and her uncle, Jesus, also died in the fire. Jocelyn’s family has since found a new place to live. Jocelyn lost her home and one of her best friends. Jocelyn lost many of her clothes in the fire, but on Wednesday, Detective Raquel Rios helped Jocelyn replace some of her wardrobe. Seventeen city police officers and one officer from the California Highway Patrol went shopping Wednesday at the Merced Mall for the Police Department’s annual Shop with a Cop Christmas program. Each child had $120 to spend. Most kids bought winter clothes and gifts for their families. The money is raised each year through a pancake breakfast benefit and community donations, and many of the officers chip in a few dollars for the kids during the shopping spree. “These are such great kids; they have such great hearts and, most of them, the first thing they think about is their family, before they even think about themselves,” Capt. Tom Trindad said. Meng Xiong, a 10-year-old fifth-grader, got to hang out with Detective Paul Johnson and bought Christmas toys from himself and his family. “I got ‘Halo’ toys, from the video game, and a Ninja Turtle toy for my brother,” Meng said. “And a remote-control helicopter,” Johnson reminded him. Meanwhile, across the mall, CHP Officer Jason Schoonhoven and 10-year-old Miguel Mencia were on a mission to find a fleece sweatshirt. They struck out at several mall shops before finding a shirt with the perfect fit tucked away in a small corner of Sears. Schoonhoven said he was grateful that the Merced police invited his department to join them Wednesday. Police Chief Norman Andrade, who implemented the program five years ago, said it’s a great opportunity to help Merced kids, many of whom otherwise may not have much at Christmas. Walk into a Target store during the holidays and you may see a joyful sight: Kids hand-in-hand with heroes from their local law enforcement, shopping for holiday gifts for themselves and their families. Events like these take place at Target stores in more than 200 communities across the country in November and December through our Heroes & Helpers program. Part of our Target & BLUE effort, the events pair public safety officers with in-need youth for a day of holiday shopping, and a chance to form strong relationships in the process. Local law enforcement selects kids and families to participate, and the kids receive donated funds from Target and other local organizations, businesses and individuals to help them get gifts and other items they need. For the past several years, Target and local public safety organizations across the country have held events similar to Heroes & Helpers in communities, bringing kids and families, holiday cheer and forming lasting connections with law enforcement. This year, Target donated approximately $200,000 to public safety organizations especially for the events. The program is just one way our teams help local heroes support their communities. One of our largest Heroes & Helpers events took place on Dec. 8 2012 at one of our stores in St. Paul, Minn. More than 200 kids took part in the event, each with their special shopping buddy—a police officer or other law enforcement official from the St. Paul area—in tow. After kids made a quick stop to hug and high-five Target’s beloved mascot, Bullseye, the men and women in uniform led their buddies throughout the store, helping them track down gifts on their lists. Then, the groups dashed across the street to the St. Paul Police Department for refreshments and special gift-wrapping service, courtesy of team member volunteers. To learn more about Target’s law enforcement partnerships and programs, visit Community Safety. Sadsburyville Fire Company No. 1 Gives Back after Responding to a House Fire. On December 24th, 2014, Christmas Eve, tragedy struck a residence of Sadsbury Township. A house that was historic to the community became involved in flames and unfortunately was so advanced by the time the fire department received the call it was a total loss. The occupant of the structure loss everything that day and suffered from burn injuries due to the fire. Recently the Sadsburyville Fire Company answered the call for help again, this time not to put out the fire, but to help rebuild. Our Assistant Chief, Dave Reynolds, owner of Diamond Ridge Construction stepped up and donated his time to put a roof on the new structure. Dave being one of many volunteers giving back to the people involved in this tragedy. Fortunately Dave knew a couple more people that would assist with this rebuild and called upon the volunteers who help put out the fire to help rebuild after the fire. This past Monday volunteers from the Sadsburyville Fire Company spent their night assisting with putting a roof on the new home. Fire Chief Adam Grossman stated, "We are glad to give back to our community at a moment's notice and glad we could help these people in their time of need. It is a tough situation to go through losing your belongings and the structure that built your life, we are glad we could help to bring closure back to the occupants of being in their home again." Firefighters Give Back to Their Communities On and Off the Job! It’s hard to miss a burly firefighter in a bright pink T-shirt. And for tens of thousands of Fire Fighters (IAFF) union members across the country, that’s exactly the point. When the public sees them in pink tees, they are reminded that breast cancer is a deadly disease requiring regular exams and mammograms. And they are urged to help women who can’t afford regular check-ups. Although firefighters put their lives on the line every day—from braving burning buildings to risking exposure to hazardous chemicals—their commitment to their communities doesn’t end with their shift at the firehouse. Nationwide, firefighters give countless hours fundraising for breast cancer research and promoting awareness. Their efforts kick into full gear in early fall as they prepare for Breast Cancer Awareness Month each October. “With our visibility out in the public, when we do school demonstrations or do training, it creates a lot of buzz, a lot of chatter, reminds people it’s breast cancer awareness month,” says Chris Leimpeter, vice president of IAFF Local 1230 in Contra Costa County. 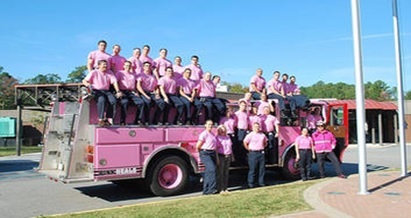 Treglio’s fire department is among dozens that participate in the Pink Heals tour, caravans of pink-painted fire trucks that travel from community to community to educate students and connect with the public about how they can help end this deadly disease. The IAFF in 2010 passed a convention resolution encouraging affiliated local unions to support breast cancer awareness and cancer-related charities. Many already were doing so. In Berwyn, Ill., the 80 IAFF Local 506 members stand on street corners in pink T-shirts collecting funds from passersby. Other fire fighters buy goods to sell from IAFF’s online store, which is packed with pink merchandise: bumper stickers, lapel pins, drawstring bags. Some participate in the Passionately Pink for the Cure campaign, many enter IAFF’s pink T-shirt design contest and all raise money for breast cancer awareness. With 1,200 members, Jacksonville Local 122 is a stand-out, raising $600,000 for local charities in the past three years. For many firefighters, raising breast cancer awareness is deeply personal. Leimpeter’s wife was 33 when she was diagnosed with the disease in 2005. Because it was detected early, she has made a full recovery. Leimpeter is determined that others won’t experience this life-threatening illness. “A lot of guys have daughters and they’d like to see [breast cancer] wiped out before they get that age,” Leimpeter says. “IAFF members are all dedicated to saving lives—and not just when responding to an emergency,” says IAFF General President Harold A. Schaitberger.